A ‘system of education’ is an alluring fancy; … because it is pledged to more definite calculable results. By means of a system certain developments may be brought about through the observance of given rules. It is no wonder why I latched on to a system. I wanted that “alluring fancy” to ensure that my own inexperience and self-doubt wouldn’t hinder my child. Looking back, reading lessons with my oldest 2 children could have gone more smoothly had I not approached it as a system. We would sit down, open our reader, and trudge through the lessons, while I inwardly hoped that they weren’t in a disagreeable mood so the lesson wouldn’t unravel. The destination I was aiming for was that they become literate, and the road wasn’t paved with good intentions, so they say. Being in systematic autopilot mode, I had firm determination that we accomplish as much in that session as possible — in my mind, that meant success. This often led to the frustrations I hoped against, and when met with the inevitable mental road blocks that came up, and the meltdowns that sometimes happened mid-lesson, I could no longer see our path to the desired outcome. I would keep trying to troubleshoot in the moment, but felt lost. Systems don’t usually account for these diversions; Diversions are, after all, quite contrary to the “observance of given rules”. A system which sounds foolproof in theory can become problematic in practice. I had no guide for those roadblocks, and my forcing the status quo to continue regardless of the wrenches that got thrown into the works did not feel like success, even when they were progressing in their ability. System, method…As long as they end up literate, does it really matter? …method is natural; easy, yielding, unobtrusive, simple as ways of Nature herself; yet, watchful, careful, all pervading, all compelling. That’s where my system failed. A child’s reading lessons need that “easy, yielding, unobtrusive” method, which allows for the proper balance of challenge with encouragement and mental rest. A system might only have as its end that which is measurable — such as the possession of rote reading skills — but then what is dismissed of the other aspects of learning which aren’t quite as measurable? What might they miss out on learning of life while they are learning to read? It might seem silly to think so heavily on what is, after all, “mere child’s play”; — just simple phonics lessons. Yet, consider: These are typically the first formal lessons embarked upon by home-educators. How will they set the course for the child’s journey of learning in general? Is each lesson a compartmentalized chore seen as a momentary interruption to the joys of life, or is it interwoven and enjoyed as a part of life itself? Instead of making connections in teaching my children reading, bonding over special moments, snuggling and smiling together over new learning, I was stressing over achieving the calculable result which I though defined success, while they perceived lessons as something to endure while habitually hoping to “get it over with, already”. A system is no respecter of persons. A method takes into account the person for whom the end goal is set. are so obviously at the foundation of TRwBB. For me, the third time has, indeed, proven to be a charm as we traded a system for a learning-to-read method. 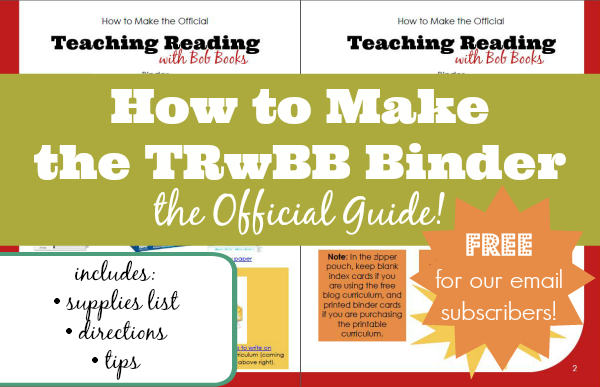 The binder we created with TRwBB is a great tool that can be used however strictly or loosely we would like. As for review, I can decide based on my child, reviewing only a few cards each day or several, adjusting as her abilities grow. I love the long-term goal of 100 books which is set right at the start. The momentum it creates as they finish each little book so soon after beginning is exciting motivation for a little learner. By focusing on smaller, clear goals, we can add a love of learning and pleasant memories to the broad goal of literacy. With these goals, and the object of the lesson clearly in view, and I can take each day’s endeavors less systematically and more naturally. Each lesson is just challenging enough to be satisfyingly encouraging to the new reader, without the risk of overwhelm or burnout. The mental preparation the lesson offers removes the decision fatigue, so I can focus on what matters during the lesson. I’m not thrown for a loop if something unexpected comes up, and I can reserve my “decision muscles”; to confidently readjust that day’s goals if a need were to arise. Early on, it felt strange to take on a tiny little Bob Book in such bite-sized pieces, but I came to see the wisdom in this. I do it every day for my 8 month old when I prepare his food in tiny, soft bits. Stopping before (rather than when) the child grows weary is definitely the more natural, (”… watchful, careful …”) approach. I found that my child’s attention and endurance in the lessons have naturally grown, and it has proven to be a much less-stressful task to start slow and speed up in proportion to the child’s growth, rather than to start fast and expect them to keep up the pace as they stumble along. My daughter gets her binder and Bob Book, we sit on the couch, she eagerly reviews that day’s sections, and she reads. By the end of Set 1, we have had zero tears, and I can’t recall a single frustrated moment. No more system. Now we have a method that fits our family. I believe any beginning reader and their parent would thrive with the method that the Teaching Reading with Bob Books curriculum offers. No tears, and no frustration. Only enjoyable, fun times with her reading binder and Bob Books, learning to read as Mom better learns to guide.